Assistant Director: William Calihan, Jr.
A Chinese princess arrives in San Francisco aboard the boat Shanghai Maid, and, several weeks later, visits Charlie Chan at his home. She gives Chan's butler, Birmingham Brown, an ancient Chinese ring, and while she is momentarily alone, an assailant kills her by shooting a poison dart through the window. 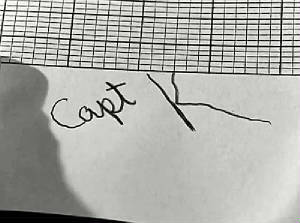 As she is dying, the princess is able to write "Capt. K" on a piece of paper, but is unable to finish the full name. Chan then calls police sergeant Bill Davidson and informs him of the murder. Bill's girlfriend, Peggy Cartwright, a newspaper reporter, arrives uninvited and identifies the princess as Mei Ling who had arrived two or three weeks earlier on a ship whose captain is named Kong. "Captain...K!" exclaims Charlie Chan. Chan soon learns that the princess had come to the United States to purchase warplanes for her brother's army in the Orient. She was dealing with a man named Captain Kelso, bringing one million dollars with her for that purpose. Kelso, who is working with Kong, has received only half of his payment, however, and Kong is also anxious to receive his share of the transaction. Kelso informs Kong that the princess is dead, and the latter accuses Kelso of committing the crime. Kelso, on the other hand, feels that Kong might have had something to do with her death. Peggy searches the princess' apartment, but hides when a masked man enters and ransacks the dresser. As she is hiding in a closet, the reporter is accidentally knocked unconscious by an object that falls from a shelf above her. Peggy comes to, and when Chan and Davidson arrive at the apartment, the three meet Mei Ling's maid, Lilly Mae Wong, as well as a mute Chinese boy who lives in the basement apartment. When Chan returns to the apartment later, he finds that the maid has been killed in the same manner as the princess. The mute boy tells Chan through gestures that he saw a masked man enter Mei Ling's apartment. Chan then pays a visit to Armstrong, the banker whose bank, the San Francisco branch of the Exchange Specie Bank of Peiping, had handled the princess' monetary transactions. He explains to the detective that although the princess' funds had once totaled a million dollars, there was only a fraction of that amount still available. Later, Chan decides to pay another visit to Armstrong at his home, which is protected by guard dogs. The banker informs Chan that he had found it necessary to put down one of his dogs that had proven to be vicious, and that he was in the process of ordering a headstone for the dog's grave. That evening, holding Armstrong prisoner in his home, Kelso and Kong, who are both interested in receiving their payoff before the Shanghai Maid sails at midnight, trick Chan into returning to Armstrong's home. Both Chan and Armstrong are then bound and gagged, kidnapped, and driven to the ship as it is being loaded. Birmingham, seeing the car pull out of the Armstrong grounds, follows. Later, at the dock where the ship is berthed, Birmingham calls Chan's umber two son Tommy. When Tommy arrives, they free Chan and Armstrong who are being kept in the car. Meanwhile, Bill and Peggy arrive at the ship, and when Kelso sees Peggy, he attempts to abduct her. As she screams out, Bill and the police come to her rescue. Kong and Kelso are both arrested by Sergeant Davidson for the murders, but Chan informs him that the two are innocent of those crimes, and that the actual murderer is Armstrong. The detective explains that Armstrong had stolen Mei Ling's money, and had then planned to swindle Kelso and Kong out of their shares of the money. He had then killed the princess' maid as well as the mute boy, whose body was buried in the dog's grave. 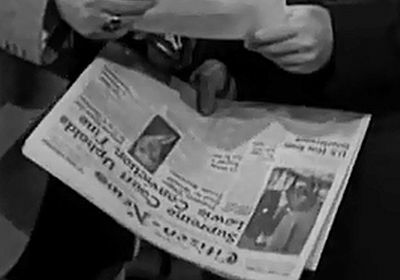 Peggy, hurrying to phone in the "scoop" to her paper, had missed Chan's exposure of Armstrong, wrongly reporting that Kong and Kelso had committed the murders. To this Chan, with a chuckle, states, "A woman not made for heavy thinking, but should always decorate scene like blossom of plum." NOTES: The title card on this film reads: Charlie Chan in "The Chinese Ring." The film's working titles were The Mandarin's Secret, The Red Hornet, and Charlie Chan and the Chinese Ring. Independent Film Journal reviewed the picture as The Red Hornet. Although Call Bureau Cast Service lists Valerie Ardis as "Stenographer," the Variety review and studio production files list Charmienne Harker in the role. This film marked the first Charlie Chan film to star Roland Winters, who was chosen to replace Sidney Toler who had died earlier in 1947. Death is the reckoning of heaven. Strange events permit themselves the luxury of occurring in strange places. Chinese chimpanzee not interfere with monkey business of big baboon. Honorable father once say, "Politeness golden key to many doors." Opportunity has flown on rapid wings. Gun does not belong with innocent face. Many time in past it has happened - Charlie Chan hoarsely barking up incorrect tree. Am number one student in school of discretion. How loud it thunder, how little it rain. Man who ride tiger cannot dismount. Confucius say, "Luck happy chain of foolish accidents." No bet - sure thing. A woman not made for heavy thinking, but should always decorate scene like blossom of plum. Man who ride on merry-go-round all the time, sooner or later must catch brass ring. Let us ride into the face of our problem. (Davidson: "I'm up against a stone wall.") Many times in past, Charlie Chan find himself in exact same locality. Let us start at commencement. Many questions arise - all in good time we get answers. Sometimes think successful detective one upon whom luck shows smiling continence. Maybe we emerge in shining garments of success. As filler material for supporting positions, "The Chinese Ring" will get by. 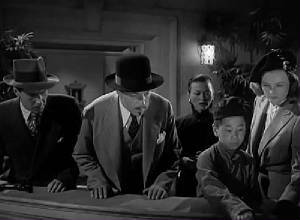 It's another in Monogram's series built around Charlie Chan, the fictional Chinese sleuth created by Earl Derr Biggers. This one draws only a fair rating due to slow pace and story holes. Roland Winters who has donned garb of the Chinese supersleuth, a character worn by a number of other character actors in the past, doesn't quite measure up to role in appearance, but otherwise is okay. William Beaudine's direction cues the movement too slowly for suspense, a factor that goes against essentially adequate plot formula furnished by W. Scott Darling. Wrapped up in this whodunit's story is a Chinese princess, in the U.S. to buy planes. When she is murdered in Chan's den, a chain of circumstances leads the detective, eventually, to pin that killing and two more on a bank manager who's trying to cut in on a large sum of money belonging to the princess. A couple of other doublecrossers, a not-too-keen police sergeant and an annoying femme reporter, all manage to keep clues sufficiently befogged so that only Chan can wrap up the case. Warren Douglas, the sergeant, and Louise Currie, the reporter, carry on a battling romance. Mantan Moreland spots some okay comedy. Victor Sen Young, Philip Ahn, Byron Fougler [sic], Thayer Roberts and others round out adequate casting. James S. Burkett has given production standard values for budget, and technical credits are also in keeping with the budget. ACCORDING TO CHARLIE CHAN, THE TYPE OF WEAPON USED TO KILL PRINCESS MEI LING: "...European type air rifle." ACCORDING TO PEGGY CARTWRIGHT, THE DATE OF PRINCESS MEI LING'S ARRIVAL IN SAN FRANCISCO: "...about two or thre weeks ago...it was on the 22nd, I think." Probably a copy of the short-lived (1945-1948) Hollywood Citizen-News. The headline points to a publishing date of March 7, 1947. 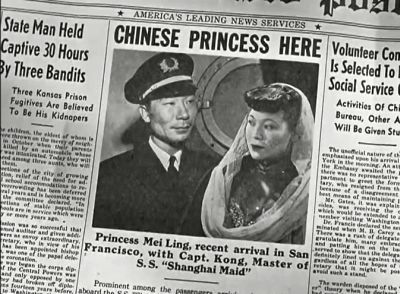 ACCORDING TO PEGGY CARTWRIGHT, THE LOCATION OF THE SAN FRANCISCO APARTMENT OF PRINCESS MEI LING: "She had an apartment in Chinatown on Grant Avenue near Bannam Place"
ACCORDING TO CAPTAIN KONG, THE NAME OF PRINCESS MEI LING'S BROTHER: "...Field Marshall Chiang Shei." ACCORDING TO THE APARTMENT MANAGER, PRINCESS MEI LING'S APARTMENT NUMBER: "...26." THE BANK NAME ON TRAVELERS CHECKS USED BY PRINCESS MEI LING AS READ BY CHARLIE CHAN: "...Exchange Specie Bank of Peiping." ACCORDING TO LILLY MAE WONG, THE TIME AS PRINCESS MEI LING LEFT HER APARTMENT: "About eight o'clock tonight." ACCORDING TO CHARLIE CHAN, THE CHINESE DIALECT HE SPEAKS: "...am Cantonese." ACCORDING TO CHARLIE CHAN, THE NAME AND LOCATION OF THE SAN FRANCISCO BANK USED BY PRINCESS MEI LING: "Exchange Specie Bank on Market Street." ACCORDING TO ARMSTRONG, THE AMOUNT OF MONEY THAT WAS ORIGINALLY PLACED IN PRINCESS MEI LING'S BANK ACCOUNT UPON HER ARRIVAL IN SAN FRANCISCO: "...a million dollars." 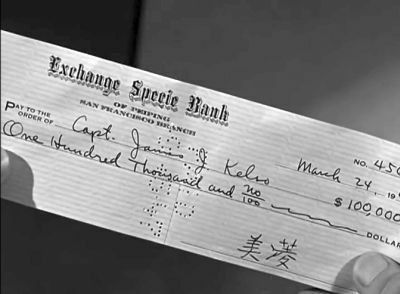 ACCORDING TO ARMSTRONG, THE AMOUNT OF MONEY THAT REMAINED IN PRINCESS MEI LING'S BANK ACCOUNT: "...around $37,000..."
ACCORDING TO ARMSTRONG, THE IDENTITY OF THE PERSON TO WHO CASHED THE FIRST CHECK: "It was cashed by a Captain Kelso who identified himself as the San Francisco representative of the Kelso Aviation Company of Los Angeles." ACCORDING TO CHARLIE CHAN, THE LOCATION OF CAPTAIN KELSO'S SAN FRANCISCO OFFICE: "Bronson Building on Broad Street"
CHARLIE CHAN'S TELEPHONE NUMBER, ACCORDING TO CAPTAIN KELSO: "The number is MAjor 4782." ACCORDING TO THE PALACE HOTEL DESK CLERK, THE SCHEDULED SAILING TIME OF THE SHANGHAI MAID: "The boat sails at midnight." THE PIER, ACCORDING TO BILL DAVIDSON, WHERE THE SHANGHAI MAID WAS DOCKED: "...pier 56." THE TIME THAT CAPTAIN KONG CLAIMED TO HAVE BEEN AT ARMSTRONG'S HOME ON BUSINESS: "I was there about five o'clock..."
dizzy - (Slang) Scatterbrained or silly. Peggy Cartwright: "...I'm a little dizzy." Bill Davidson: "You're telling me!" honey and molasses - (Idiom - as used) Sweet talk. Birmingham Brown: "Uh-oh, listen to that old honey and molasses." kosher - (Informal) Genuine, authenic. Birmingham Brown: "Uh-oh, this don't look kosher to me." Peiping - An archaic form of Peking or Beijing. Charlie Chan: "...Exchange Specie Bank of Peiping." San Quentin - The oldest prison in the state of California. Located near San Francisco. The Chinese Ring - Bill Davidson: "With a little luck, we have enough to send them to San Quentin for life." specie - Coined money; coin. swindle sheet - (Slang) An expense account. Peggy Cartwright: "I'll have the chair fixed and put on my swindle sheet." tong - (Chinese) A Chinese association or political party. Tommy: "...the head of the Hip Sing Tong."